The world's largest and most complete online program for disordered eating recovery. I've recovered from a lifelong battle with full-blown bulimia and helped countless women do the same. Justscroll downto read more about this program, learn how I can help you andget free resources. I am thrilled you're interested in Make Peace With Food - the modern online program for smart women who want to fix their broken relationship with food and get a healthier, happier life. Because we can’t reach our full potential nor enjoy life to the fullest with an eating issue, my mission is to give you the information and techniques you need to create a peaceful relationship with food, and a better life with ease and grace. Full recovery is totally possible. It doesn’t have to be hard or to take years, and you deserve it. I am Pauline Hanuise. I’ve recovered from a lifelong battle with full-blown bulimia and created the life of my dreams. I’ve helped thousands of women around the world making peace with food and creating the life they really wanted - where bulimia, binge eating and food addictions have no place. My mission is to help you do the same. I am a certified holistic recovery and health coach. I am one of Cosmopolitan's top 5 women in health and wellness, and I am also endorsed by many health and wellness brands like Food Matters, Synergy Natural, and Vitamix. But most importantly, I’ve lived with full-blown bulimia for over 15 years and have been through the recovery process myself. I know how it works, I understand the patterns. This is why I’ve been able to - not only help others - but get outstanding results with my approach. My deepest hope is to be able to help you achieve total food freedom and finally reach your full potential. My life has completely changed in an extremely positive way: I AM NOW HAPPY! I now know that recovery is 100% possible for me. I have experienced huge changes! I have really learned to love myself and this changes everything. I have changed a lot – on all levels – and feel really positive about my future. I had been to endless therapy and appointments and I thought there was nothing more anyone could do for me. I now know that things can change. No words will ever truly reflect the immense gratitude I have for you, and the way in which you have helped me… you have changed my life. Pauline knows well what she is talking about. Because she lived with bulimia for 15 years and recovered, she is able to understand perfectly what it is to be stuck in this dark place and knows how to set you free! I am so happy I've found Make Peace With Food! I’ve done a ton of reading/research. I’ve only found clarity here. Make Peace With Food allowed me to move away from food obsessions, to think big and have the energy and focus to move towards my dreams. I had already tried many different things to recover but this program saved my life. Words can't describe how grateful I am for this experience. My outlook on life, my thoughts and feelings about myself have totally shifted. I love myself more every day, I am much happier and I am also much more comfortable in my body. I have gained much more self-confidence, self-love and overall peace of mind. My experience has been amazing! Pauline’s knowledge and wisdom are admirable and she is a great role model. I now know that my eating disorder was not my life, as I thought. My future will be longer and filled with happiness. I learned so much and I was able to put the ideas immediately into practice and already see results. Make Peace With Food is the only course you need for 100% clarity and all the right tools for binge eating and bulimia recovery. Make Peace With Food has helped me to erase my destructive eating behaviors. I am now happier and also more present with my kids and loved ones. Not ready to make lifelong positive changes yet but still want to stay in touch? No problemo! Just enter your name and email below to join 10,000 women who are reclaiming freedom over food. 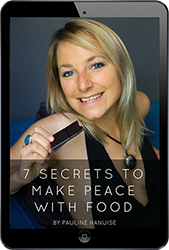 You'll also receive myFree "7 Secrets To Make Peace With Food" eBookand aFREE 2-week email coaching seriesto help you start shifting things around and reach your full potential. I've helped countless women change their relationship with food and create a healthier, happier life. My life before the program was pretty dark. I was extremely sad and depressed. I was stuck in my own reality, unable to see the light at the end of the tunnel. My bulimia was taking so much energy out of me and the crappy foods I ate gave me a foggy state of mind. Even-though I was always smiling on the outside, I was actually full of tears on the inside. I was feeling shameful and guilty almost all the time. I was unsatisfied and alone but couldn’t think about how to change because I was too confused and didn't know where to find help. But one thing was for sure: I wanted to change and be happy. What were your main fears and doubts about the program? My first fear was that I would have to reveal my reality to somebody. Then, my second fear was to be able to tell my story without being judged. I was very scared to be labelled as “not normal” and to be told that my bulimic behaviours were the worse that have ever happened. My third and last fear was about not being able to change and apply the recommendations that were given to me. I chose this program because I was feeling I had to change something to get better but didn’t know where to turn myself to. I had already tried many different things such as psychotherapy and hospital treatments but nothing really helped me seriously. Can you tell us a bit more about your experience with Make Peace With Food? My experience has been so great that I am studying to become an holistic health coach myself. It was impressive to see how changes can occur in such a short time with the right help and guidance. At the start, I wasn’t expecting anything because I’d already asked for help so many times without any success. I didn’t think anything could change. I had ups and downs. Some periods were very tough and others were easier but I was progressing without always noticing it. What kind of shifts and changes have you experienced with the program? The changes I experienced were awesome. I didn’t really realize the changes while they were occurring though. But suddenly, after a few months, I looked back and had a big laugh. I was much happier and balanced than before. I was enjoying food again and thinking more positively. I was full of positive projects, open minded, confident and full of energy. What a shift! How do your feel about your future? I feel this program saved my life and placed me on the right path. I can’t wait to change my life even more towards happiness and become a Holistic Health Coach myself. I am very grateful for this experience. Aline has just become a mum and is full of joy and happiness, healthier than ever before. She is not afraid about influencing her daughter with her broken relationship with food... because she doesn't have any issues anymore! I had been in recovery for many years before starting Pauline’s Make Peace With Food program. I considered myself to be at a plateau stage of my recovery. I had already made a fair amount of progress. I had enough energy to function day to day and hold down my full time job. However I was still binging and purging several times per week. I was anxious, stressed and depressed. I felt like I needed bulimia to cope with life but I hated it at the same time. I hated myself and my body and felt a huge amount of guilt and shame. I was worried that it wouldn’t help, I felt like I’d “tried everything” but nothing would really help me. I was also scared of losing bulimia as a coping mechanism. I was worried about gaining weight. I thought I would never be free. But I knew that I needed help to do this. I had already tried a few different recovery methods before and hoped this would be a different approach. I wanted to change my life and be happy, healthy and strong. What kind of changes were you aiming for? I wanted to be completely free of bulimia and binge eating, get happier and healthier, which I did! Can you tell us a bit more about your experience? I hadn’t tried coaching before but I loved Pauline’s approach. It’s more personal than psychology. Pauline’s approach is more motivating, inspirational and the activities are fun. I found when I do that and follow Pauline’s guidance everything else fells into place. I have experienced huge changes in myself. My outlook on life, my thoughts and feelings about myself have totally shifted. I’m much happier and able to deal with stress. I love myself more every day and I am also much more comfortable in my body. I am eating very well and I am feeling more vibrant and energetic. I feel amazed and very proud about that! I am excited about all the things I plan to do and I know that recovery is 100% possible for me. Before I started working with Pauline I was pretty miserable! I had been trying to get over my eating disorder for years but hadn’t been successful. I had been doing a lot of 12-step work but even-though that had helped me, I was still caught up in the bingeing and purging cycle. Not a very nice plan for my life. I wasn’t feeling great with my body and life. My self-esteem was also very low, lower than it has ever been. I doubted of myself on many levels and was really harsh on my own person. The worst was that I didn’t even realise it. It thought it was just life and how others also lived it! I was concerned that the work would be based on self-analysis. Although I had already done a lot of 12-step work through OA and loved the group, I just felt that more introspection wouldn’t really help me. What kind of changes were you aiming to achieve with the program? I was aiming to live free of my obsession with food. I wanted to feel light and good in my body and soul. I wanted to love myself fully and unconditionally. I am proud to say that I achieved all these changes, big time! My experience has been amazing! I have really learned to love myself. Pauline's program is great! She knows how to direct you on the right path and to tell you the exact things you need to hear in order to open your eyes. She will teach you a new way of looking at things and at life in general. I have changed a lot! It’s hard to explain it all but for me it mostly comes down to accepting and loving who I am – on all levels. I have gained confidence and trust in myself as well as self-love and overall peace of mind. I feel really positive about my future. For sure, life is not perfect and things aren’t always easy but I have learned to choose more enjoyable pathways! That line weighs a little heavy on my heart, but only for a moment, only because of the darkness I felt at that particular moment in time. I have suffered with bodies issues, food issues, self worth all my life and I never ever believed that it would or could change… that was of course until I met you. I had been through everything; counselling, exercise, fad diets, personal trainers, restricting, bulimia.. the works! Admittedly I was not sure if even you could ‘fix me’ I felt completely and utterly unfixable. Here I am today, over six months on and I have transformed. You have helped me to see that I am the person in control, and responsible for my own happiness. You have helped me to see that I am a beautiful person inside and out. You have helped me to see, and live my real truth. You have helped me to believe in myself, beyond all doubt. You have helped me to be proud of myself and all of my achievements in life thus far. You have made me see my true strength. You have helped me to learn how to let go of things that no longer serve me in a positive way. But most of all dear Pauline, you have taught me to love myself unconditionally, beyond all doubt and reason, but most of all to know that I deserve it, and I deserve to be happy. Thank you dear Pauline, from the bottom of my heart. I am happy. I deserve it. I have found peace. I can't speak highly enough of this course. The material that Pauline presents here is SO empowering and really nothing you will find just browsing the internet and in blogs and whatnot. I've done a ton of reading/research. I've only found clarity here. I learned so much and I was able to put the ideas immediately into practice and already see results. I've never met Pauline personally and I'm the type of person who never writes reviews. I'm writing this simply because from the bottom of my heart, I think this course can change your relationship with your body, yourself, your mind and food for the rest of your life like nothing I've ever seen. I did email Pauline a question and she was so incredibly generous with her responses so you truly can reach out to her as she says. The way Pauline presents the information (she is so empathetic, kind and also extremely clear) it will make you feel better immediately in addition to giving you real, solid things you can do to turn your life around. She also doesn't overcomplicate things, which is another gift that makes recovery so much more achievable in my opinion. You don't need to suffer anymore. Do sign up. I can say with all my heart, it is totally absolutely worth it and I'm happy for you for having found this! This is the only course you'll ever need for 100% clarity and all the right tools for binge eating and bulimia recovery. Before I considering the program I was lacking motivation to continue recovering. I had been working on my eating disorder and depression for about 2 years. I was at the recovery ‘half way house’. My eating, disordered habits and motivation to recover were inconsistent and I didn’t know what else to do as I was in therapy with psychologists and psychiatrists and thought they would simply just ‘fix me’. I felt very alone and although I did have people to turn to who were supportive I never reached out for their help because of their lack of understanding. Although I did want to change, I didn’t think anyone could do anything or help me. I believed my eating disorder was my life and I had to accept that this was my potential and nothing could change. What were the feelings you experienced before the program? I was unsure and a little bit ambivalent towards it. I was questioning whether it was actually worth it. Would it be different from my current therapy? Would I have heard it all before? I had been following Pauline’s blog for some time and I actually decided to contact her for a chat. I was very apprehensive, as I thought that I couldn’t change. I had been to endless therapy and appointments and thought there was nothing more anyone could do for me. I wanted to change and accepting Pauline’s help was a big step in itself. Pauline helped me understand that I can have more and I don’t have to be my eating disorder forever. In the initial sessions, Pauline gave me hope and I chose to continue working with her and her program. Probably one of the best choices I've ever made. 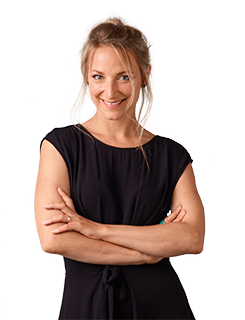 Her approach is refreshing and insightful, very different from the standard health professional. I could really connect with Pauline as she provided insight and advice from her personal experience. Pauline was kind, encouraging, bubbly and friendly. Her knowledge and wisdom are admirable and she is a great role model. I am now able to differentiate my rational & irrational thoughts and realised how debilitating negative self-talk can be. I have been able to incorporate a regular intake, positive affirmations, yoga and self-love activities into my daily life. I have become aware of how deceitful my eating disorder voice is and I am now able to challenge these thoughts successfully. This's had such a huge positive impact in my life! I have definitely noticed my increased interest in life and activities I enjoy. My friends and family have noticed significant positive changes and increased zest for life. My future will be longer and filled with happiness, much more than it was before I begun working with Pauline. Because our body is a complete system and that each part are constantly interacting with one another, we can not address any destructive pattern if we are not looking at the whole picture. Addressing any eating problem with therapy only, is the exact same as trying to build a house starting from the roof. It's just not going to work! You might eventually notice some changes, but the sad reality is that they won't be sustainable. This is why I've always worked with a holistic approach, addressing the different levels of the issue simultaneously. Make Peace With Food has been specially designed to do just that and will tackle your distorted eating patterns on different levels, in a very structured way. It is the only online program available that has received such great results from women who have once suffered in silence, but are now enjoying their lives. There is no other online program like this one. The truly amazing results I’ve gotten speak for what you can achieve with Make Peace With Food. Make Peace With Food is the world's largest and most complete online program for disordered eating recovery. This program is one of a kind in the world of disordered eating recovery. What is healthy physical activity? What’s a rocking body image? Why having a rocking body image is important to make peace with food? Who do you want to be in this world? Because everyone is different, we all need different type of support at different moments of our lives. This is why we offer 3 special and very different packages to help you change your health and life. So, are you ready to finally get the help you deserve and allow yourself to reach your full potential? Feel free to contact us atinfo@paulinehanuise.com, we are here to help and will be in touch shortly. We have a non-spam policy. Your data won’t be communicated to any third party. DISCLAIMER: this information is based on my own personal experience, gained working on my own recovery and coaching many others do the same. I am sharing this information for educational and informational purposes only. Please consult your healthcare provider to determine the best course of treatment for you. You expressly agree that your use or inability to use the Make Peace With Food product is at your sole risk. By purchasing the Make Peace With Food Online Program, you accept, agree and understand that you are fully responsible for your progress.